Thanks to Mr. Mohan Kolar, VP - HRD; Mr. Rajesh N Jagdale, MD, Jagdale Industries Ltd., ... my employer company, I had a unique opportunity to attend a training session by Mr. Shiv Khera, master trainer - sales person - businessman - motivator. Mr. Shiv is a dedicated trainer - courageous - focusses on the learner and bringing out the learner's potential. He is not there in the training program to establish his masterly grasp on various skill sets ... Mr. Shiv is there to bring the envisioned change in the learner. It was at ITC Windsor Manor, Golf course road, Bangalore: that I had the good fortune to participate in Mr. Shiv's public speaking - optimizing performance (2 day workshop: 14.4.2014 and 15.4.2014). The workshop was absorbing, tedious and engaging. Never a dull moment - not a single moment wasted! He with dedication kept learners engaged till 8.30 pm on day 1, and on day 2: till 7.15 pm, giving him just enough time to leave for airport and catch his flight back to Delhi!! Mr. Shiv's business-like focused training approaches are learner - centric. He is what a trainer/coach ought to do - motivates and makes learners' work hard at bringing out the change required by each of them. Mr. Shiv does it with courage, dedication, love, strictness, no-nonsense style, very ethically, with high moral values and hands-on training style. While Mr. Shiv is excellent - he is also pricey!! Never mind that point, because he is a great businessman too - gets his value (practices business tenets that he preaches: always sell on perceived value - not on price!!). Mr. Shiv displays and markets Shiv Khera branded merchandise (mugs, trolley bags, pens ...) at his training venues: Mr. Shiv markets himself as a premium brand that stands for success and bringing out attributes required for success among learners. Mr. Khera's trainings are not 'bookish' - they represent his learnings' (distilled wisdom/experience of decades). Mr. Shiv is a down-to-earth salesman: during tea breaks' he stands near the merchandise and markets the items to his learners, without qualms, with lots of conviction: he is clear - his books and other merchandise stand for change, will help change and there is no hesitation in him, while promoting his books/CDs/merchandise. The items are truly pricey ... but Mr. Shiv is selling on perceived value: not on price. This is the first learning for any marketing person: Mr. Shiv lives his professed values - no hypocrisy. While I picked up his books, CDs etc, I could not help but get started - the first thing after completion of the training program, on YOU CAN SELL: a book on salesmanship; after all, it is directly related to my bread and butter, since I am a pharma marketing guy into training and business development. The above statement is on page no. 10 of YOU CAN SELL. The import of this statement is that every person is a salesperson: we are always selling something or the other: for eg., selling the idea to my family that we ought to go to MTR 1924 rather than Adigas for dinner. The above key statement has to be taken broadly: selling need not involve exchange of an idea, item or service for money; the exchange can be between individuals/parties in a non-monetized way. Another topical example, is that politicians are selling across the idea that he or she is the best candidate to become a MP: based on various attributes of the person, this exchange process results in votes (not notes!) for the candidate. So the book YOU CAN SELL is universal: just right for everybody! This is an amazing key statement on page no. 18 of YOU CAN SELL. Enthusiasm is intense energy with positive emotion. There is no doubt that with full involvement and hard positive creative work, there are success vibrations, and this helps create enthusiasm and required changes in the behavior of buyers/prospects. Sales and marketing personnel in fact, see this on a day - to - day basis. That is why one exhorts to sell with passion and conviction (this gets reflected as infectious enthusiasm). Key point no. 3: THEY DO NOTHING TO MAKE THEIR TODAY BETTER THAN YESTERDAY. The above statement is on page no. 27 of YOU CAN SELL. This statement is the piece-de-resistance! The statement can be modified to: MAKE TODAY BETTER THAN YESTERDAY. What an amazing statement!! This statement helps practice a very important virtue: PRESENT MOMENT LIVING. The concept of present moment living is that we are not trapped by past events or possible future happenings. An individual thus, does not live in the shadow of past events (like a failure in an exam, or inability to get an order from a customer/prospect etc., or reflecting on some painful memories like impoverished childhood, inability to go to elite schools or English medium schools etc); furthermore, the individual does not live worrying about the possible events that may occur in future time. When a person focusses on MAKING TODAY BETTER THAN YESTERDAY, inevitably, he/she practices PRESENT MOMENT LIVING. The individual benchmarks his today against yesterday, and strives to make his today better than yesterday. The change in a person while practicing this tenet is awesome. It is empowering. This statement helps change our response to various situations & triggers - this ensures that today is better than yesterday. Working to make today better than yesterday, brings out determination and commitment in the practitioner. I can't but help think of the statement from the Bhagavad Gita: Karmanye Vaadika Raste Maa Phaleshu Kadachana - this line too exhorts individuals to work with focus, on the methods (in the 'present moments') rather than worrying or fantasizing about future happenings (future moments). So the bottomline is to concentrate on 'MAKE TODAY BETTER THAN YESTERDAY'! This is truly a WOW statement ... absolutely empowering thought. The above approach of breaking down the overall message into three key points, with each point supported by examples, narrations, anecdotes or other evidences: is a trademark tenet practiced and taught by Mr. Shiv Khera. His style of communication is Americanized... there are liberal American examples, very less Indian-ness, however, the training sessions are truly empowering. There is no doubt - Mr. Shiv Khera, through his caring nature, business-like approach and 100% commitment: is contributing to the growth of Indian society. 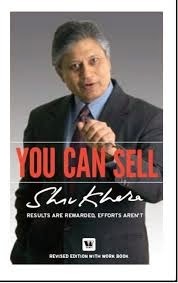 Three cheers to this man: Mr. Shiv Khera!! Please scroll down to read other blog posts, kindly recommend this blog to your colleagues/family! Excellent post. I was checking continuously this blogs and I'm impressed! Very helpful information specially the remaining part :) I care for such information much. I was looking for this particular info for a long time. Thanks and best of luck.